In one of the largest commitments to 4K HDR and Dolby Atmos by any U.S. broadcaster to date, NBC is presenting roughly 12 hours of content per day in the next-gen video and audio formats on a one-day delay throughout the PyeongChang Games. 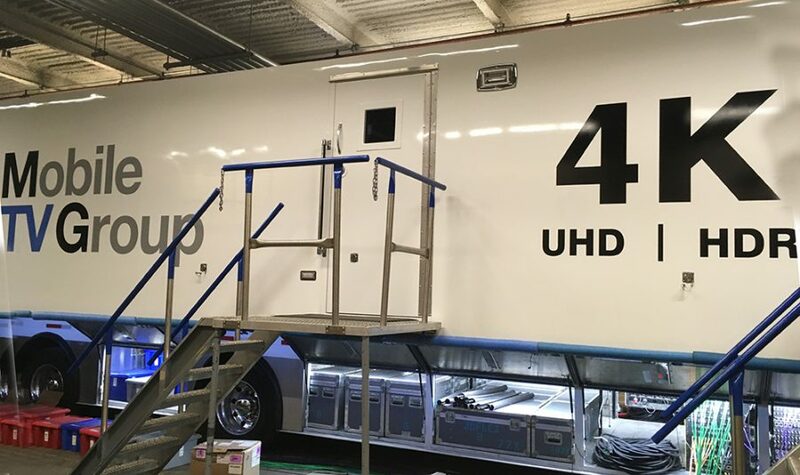 OBS and NHK are handling capture of the 4K HDR and Dolby Atmos material, and these feeds are being sent to NBC Olympics’ Sports Production Operations Center (SPOC) in Stamford, CT, where Mobile TV Group’s 39FLEX 4K mobile unit is parked at the truck dock to integrate the production and a pair of off-tube booths add commentary. Mobile TV Group’s 39FLEX mobile unit is parked at the truck dock at NBC’s SPOC in Stamford to serve the 4K HDR/Dolby Atmos production of the PyeongChang Olympics. NHK and OBS are providing NBC with a downconverted feed of their 8K HDR coverage, while OBS is also serving up 4K SDR coverage from Hockey 1. There are two 4K feeds being sent to Stamford and one return. OBS is providing NBC with two sets of 4K HDR HLG feeds on four fibers formatted as 2SI, as well as a third set of fibers carrying the 4K SDR Hockey 1 feed. Any two of these can be sent to the SPOC at a time, and a third can be recorded on a local Sony PWS-4500 4K/HD server at the IBC. Theses 4K line-cuts essentially serve as the program feeds for the 4K HDR coverage, so no switching is necessary inside 39FLEX. Instead, a small production team is led by a single director/producer at the front bench, and NBC-branded graphics are inserted. Four Sony PWS-4500 servers are also recording content inside 39FLEX as it comes in. A combo director/producer is at the front bench of MTVG’s 39FLEX for NBC’s 4K/HDR production in Stamford. Two off-tube booths with rotating sets of announcers create the voiceover for all of this coverage — either live as the content comes in overnight or the following day. In addition, OBS’s 4K SDR Hockey 1 feed is being converted to HDR inside 39FLEX. 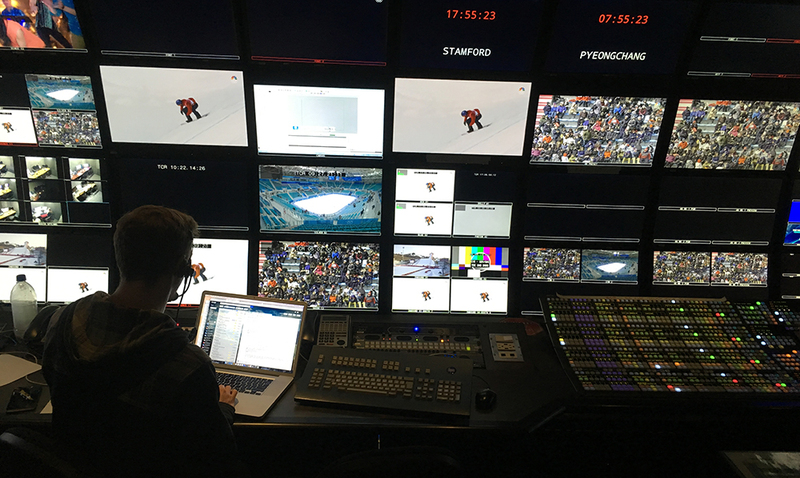 NBC Olympics Director of Advanced Content Production Technology Chris Seeger is overseeing the inverse–tone-mapping process to make this happen. About 12 hours of 4K HDR content is being delivered each day from the truck to Comcast VOD servers in Englewood Cliffs, NJ, via redundant 10-gig paths. In addition, a linear feed is being fed to other participating MVPDs, including DirecTV and Dish Network. The 4K HDR content is delivered the following day to subscribers of these MVPDs with the necessary 4K HDR TV and set-top box. For the Dolby Atmos audio, the encoded Atmos feed is a 5.1.4 mix that NBC is generating from a combination of the 5.1-surround mix and overhead height mics provided by OBS. NBC has the choice of the OBS 5.1 downmix or the 5.1 downmix from NHK’s 8K, 22.2-channel-audio Super-Hi Vision production. That is sent to Stamford with an audio split of four height mics as well as a split of the PA system in the venue and the announcers. Once there, it is mixed by A1 John Steigerwald inside the 39FLEX audio room. The 10 discrete audio channels are sent to NBC’s Englewood Cliffs, NJ, facility for encoding into Dolby Atmos for delivery to participating MVPDs. CLICK HERE for more on NBC’s Dolby Atmos audio efforts. 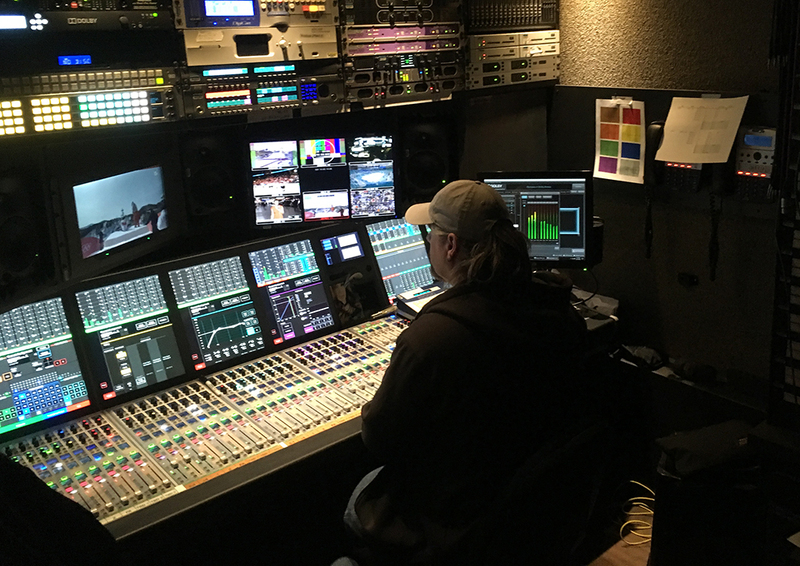 This is Part 2 of SVG’s three-part series on NBC Olympics’ at-home operation in Stamford, CT. Be sure to check out Part 1, a look at the overall setup in Stamford; and Part 3, a look the Highlights Factory.